There are a number of reasons to be excited about Song Yadong, so we’re just going to dive right into them. First and foremost, the Chinese bantamweight doesn’t turn 21 until December and yet he already has 18 professional fights under his belt, including a pair of victories in as many trips into the Octagon. Secondly, he spends at least some of his time training with Team Alpha Male, which has long been considered one of the best gyms in the sport when it comes to identifying and developing talent in the lighter weight classes. Working in a room that includes former bantamweight champ Cody Garbrandt, Chad Mendes and a collection of others, as well as a group of solid coaches, can only help the youngster develop. Next, Yadong’s sophomore appearance in the Octagon wasn’t your typical “local fighter showcase” bout that we’ve become used to seeing on international fight cards. After dominating Bharat Khandare in his UFC debut, the bantamweight prospect was dropped in with Brazilian veteran Felipe Arantes in his second assignment and he handled the matchup with aplomb, coming away with a second-round stoppage victory. While the Brazilian Arantes was never able to find enough consistency at the UFC level to develop into a contender, he still entered that June contest with 30 bouts and 18 wins on his resume, including a 5-5-1 record inside the Octagon. Prior to facing Yadong, he had only been beaten by solid competition, including Iuri Alcantara, Andre Fili, “Goyito” Perez and Josh Emmett, with Yadong becoming the third member of the Sacramento-based team to get the better of “Sertanejo” under the UFC banner. Did I mention that he doesn’t turn 21 until December? What ties it all together and makes Yadong someone people should already be checking for in the bantamweight division is that he’s aggressive, athletic and powerful on top of having a wealth of experience and working with a strong camp. He moves well, showing quick hands and solid footwork, while exhibiting a sound understanding of how to mix up his shots, change levels and step on the gas when he’s got his opponents in trouble. As much as rolling through Khandare was good, the fact that he was able to break Arantes’s will and get him out of there with one second remaining in the middle stanza was truly impressive. The UFC clearly understands that he’s a quality prospect and someone to take a closer look at as he was originally scheduled to square off with veteran grinder Frankie Saenz this weekend in Beijing. The unheralded Arizona State alum gave Team Alpha Male leader Urijah Faber fits at UFC 194 and has earned back-to-back victories following a three-fight skid, which would have made him an excellent step up in competition for the young Chinese upstart. But with Saenz forced to withdraw due to an injury, Yadong will instead face off with Contenders Series alum Vince Morales, who dropped an entertaining scrap to new signee Domingo Pilarte in July and got back into the win column at Bellator 205 two months later. As much as the bout with Saenz would have been a fitting test for the promising upstart, Saturday’s new matchup could be instructive as well. This is the kind of matchup Yadong should dominate — a pairing against a regional veteran making the trip to China on short notice — and how he looks on Saturday will go a long way to determining how much hype he carries with him into 2019. 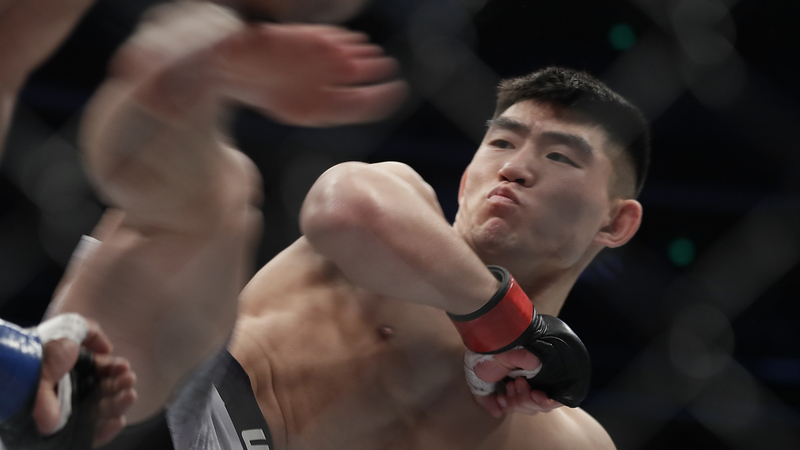 Bantamweight is flush with talent, but with the title chase currently at a standstill, with champion T.J. Dillashaw expected to venture to flyweight to square off with Henry Cejudo at UFC 233 at the end of January, there is a chance for fighters like Yadong to gain momentum and make headway in the rankings over the next eight to 12 months. While the Top 10 is pretty well established, things are fluid beyond that, with a limited number of young, emerging talent working its way up the ladder. A third straight stoppage victory would elevate Yadong into the grouping that includes Sean O’Malley, Ricky Simon and Manny Bermudez as the relative newcomers with momentum in the 135-pound weight class. From there, it’s all about his development and how he’s matched up, but the potential would be there for the Chinese prospect to truly establish himself as one of the top young fighters on the UFC roster.